A few weeks ago I made a brownie recipe called Marilu’s Effortless Fudge Brownies. The featured product was a natural sweetener called Sucanet. The shine and texture of the brownies was incredible, but the Sucanet gave them an odd taste. I decided to try the same recipe again, but with plain old brown sugar. Since it was an experiment, I opted to make half the batch in an 8 inch pan. The results were fabulous!! 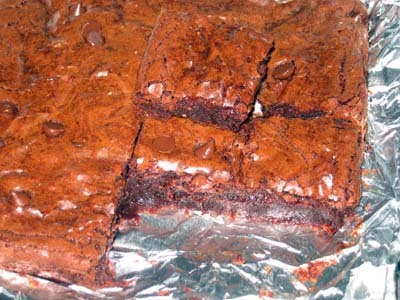 These brownies are very fudgy, and as you can see from the picture, have an extremely shiny top. Here, the brownies are at their fudgiest because they have only cooled for an hour or so. They taste very good at this point, but I have a feeling after they’ve sat in the refrigerator overnight they will be even better. For such a simple, straightforward and inexpensive recipe, these are excellent. Preheat oven to 350 degrees F. Line an 8 inch square pan with foil and grease bottom of foil. In a heavy saucepan, partially melt butter. Stir in chocolate chips and continue to melt over low heat until smooth. Turn off heat. Stir in brown sugar. Chocolate will look grainy. Stir a little of the chocolate mixture into eggs to temper, then stir eggs into chocolate mixture in saucepan. Stir in vanilla, flour and salt. Pour into pan and bake for 28-30 minutes. Let cool. These are good the same day, but will be even better on day 2. Naomi, thanks for the feedback. I love this one too. These are fabulous. My sister and I made them tonight. We only used two eggs, but they were still absolutely delicious. Thanks so much. Woo Hoo! Glad you liked them Annie. Since this is one I played around with (adapted from the sucanet recipe by Marilu Henner), I was a little worried that they wouldn’t work out for everyone. So far, so good. I substituted 2 tablespoons of cocoa powder for the 2 tablespoons of flour and they were extra chocolatey. I keep getting requests! Glad they worked out for you, P.
Mmm, thanks for the recipe! I only had two eggs, and I threw in some homemade marshallows and peanut butter chips. Very gooey and rich. Gary loves brownies. I might have to make these for his next bridge party.